The True Adventures of Nicolo Zen by Nnicholas Christopher. Review: Recently orphaned Nicol˜ Zen plays the clarinet beautifully,and he lives in an orphanageÉfor girls. Adriana is a girl with whom Nicol˜ falls in love with. She might be the long lost heir of the duke. Nicholas Christopher tells their story in The True Adventures of Nicol˜ Zen. In The True Adventures of Nicol˜ Zen, Nicol˜ is just a regular boy until a disease wipes out his mother, father, and two sisters. He gets into a music-based orphanage for girls and soon falls in love with a girl named Adriana who may just be the heir of a famous duke. He also befriends a girl named Julietta who goes missing, and Nicol˜ gets worried. He uncovers a dark secret about the people in charge of the orphanage. Will he ever find Julietta? Can he keep Adriana safe? Will Adriana ever find out about her true past? 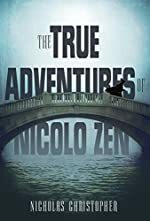 We would like to thank Random House for providing a copy of The True Adventures of Nicolo Zen for this review. Have you read The True Adventures of Nicolo Zen? How would you rate it?